Firstly, the Green Cone Waste Digester is not a composter. It's a three-section injection moulded waste digester (with lid) that digests all your household food waste, including vegetable scraps, raw and uncooked meat / fish, bones, dairy products and other organic kitchen waste like tea-bags, bread etc. 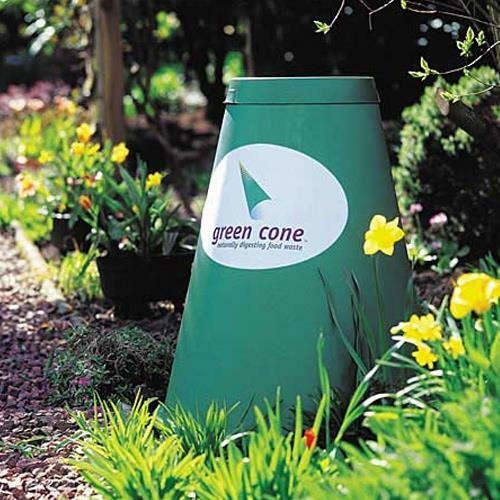 The full kit consists of a lower basket installed slightly below ground and which forms the base for the above ground unit comprising a black inner cone and a green outer cone with a matching flip-top lid.This patented design utilises the solar heating effect between the black inner and green outer cones to facilitate air circulation. This in turn aids the growth of beneficial micro-organisms and the aerobic digestion process which gets rid of your food waste. The food waste is converted into water (90%), carbon dioxide and a small amount of residue which need only be collected and removed every few years in an effectively operating Green Cone. The Green Cone comes with an accelerator powder which you simply add a handful of if you notice the furry bacteria disappear. It is also recommended to use the accelerator for the first couple of weeks after setting up the Green Cone just to encourage the friendly, helpful, bacteria to multiply. 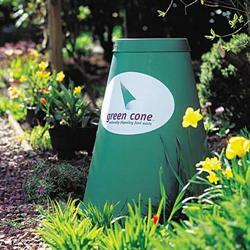 - Outer Green Cone 55cm at Base and 29cm at Lid Diameter. - Does not attract vermin. Buying this product will earn 1029 Loyalty Points. Be the first to submit a review for the Green Cone - Food Waste Digester.